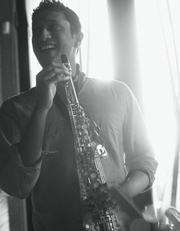 Om Srivastava, DMA, is a saxophonist and educator passionate about contemporary and world music. Srivastava has performed throughout the United States and abroad including featured performances with the Kokomo and Ball State Symphony Orchestras, as well as with the BSU Jazz Ensemble's tour of China. He has been an active performer in the festivals of the Chautauqua Institute in Chautauqua, New York, the New Harmony Music Festival and the Covington World Music Fest. DMA, University of Cincinnati College-Conservatory of Music, Cincinnati, OH (Saxophone Performance; Ethnomusicology Cognate). MM, University of Cincinnati College-Conservatory of Music, Cincinnati, OH (Saxophone Performance). BM, Ball State University, Muncie, IN (Saxophone Performance).